The enchanting island of Venice may seem small compared to Italy’s main destinations, yet millions of tourists visit ever year. And not only is Venice an increasingly popular destination, but despite the city’s size, it’s easy to get overwhelmed and lost in the never-ending maze of narrow streets and bridges. 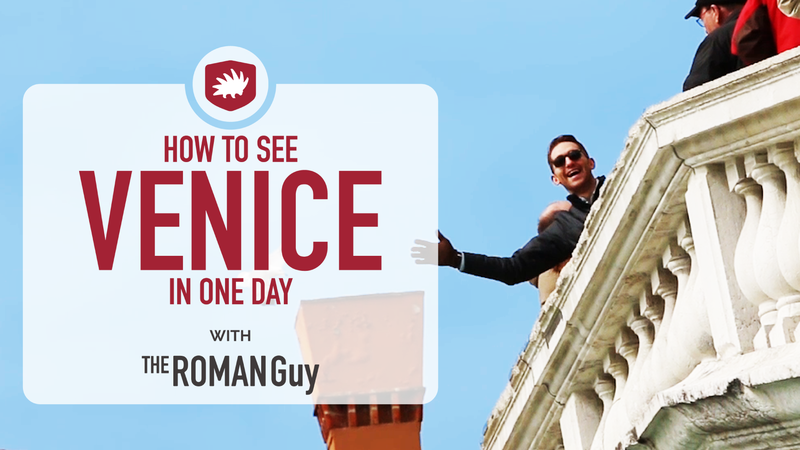 The best way to visit Venice is a day trip – and we’re here to help! 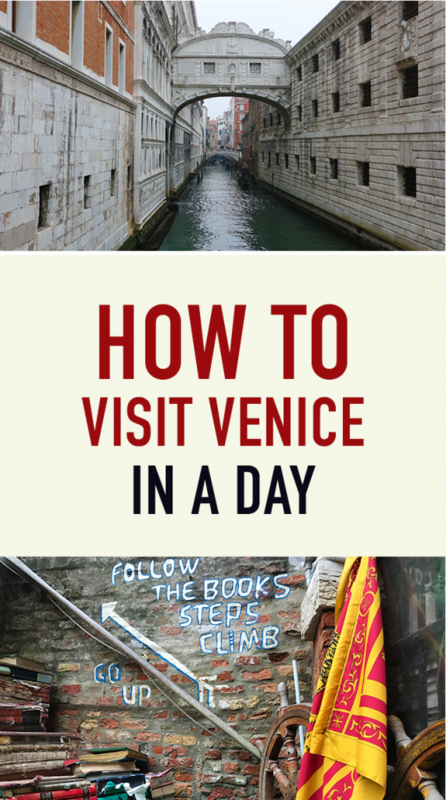 Use our suggested Venice in a Day itinerary to catch all the top attractions and stunning hidden gems. 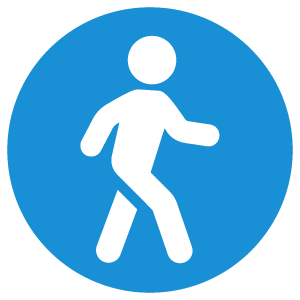 Simply stick to this schedule and wear your best walking shoes. Departure 6:15a.m. - Arrival 10:00a.m. Located in the lagoon facing the Adriatic Sea, Venice is a fish-shaped island made up of 118 smaller islands. Easy to reach from many Italian cities, simply hop on a high-speed train and arrive in no time. Train travel makes seeing Venice in a day easy. 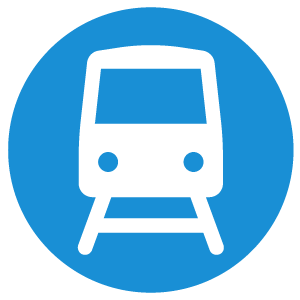 Find time tables and departure times on the Trenitalia website, by selecting Venezia S. Lucia as your arrival station. Keep in mind that planning ahead and leaving early in the morning is essential to secure the best price and seats. If you want someone else to handle the details, The Roman Guy offers excellent Italy Trip Planning Services. Once you arrive in Venice, the best way to get around is by foot. All the main tourist attractions are within walking distance from one another. However, public transport is available via expensive water taxis, traditional gondola rides and easily accessible ferry boats. Check out the ACTV website for water bus info and tickets. Arrival 10:30a.m. - Departure 11:30a.m. About 30 minutes by foot or 20 minutes by ferry boat from the train station, St. Mark’s Square will leave you speechless at first sight. One of the most recognizable squares in all Italy, St. Mark’s Square is home to the magnificent St. Mark’s Basilica, Bell Tower and Doge’s Palace. 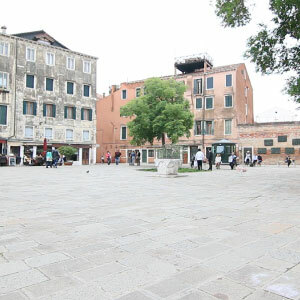 The biggest square in Venice is the only one Venetians call a “piazza” – the smaller ones are called “campo”. The Bell Tower, or campanile, is 99 meters tall and used to function as a lighthouse and watch tower. If you want to experience one of the best views of Venice, visit the Bell Tower at sunset. If you’re plan on visiting the inside of the Basilica, either buy your tickets on the Veneto Inside website or take a guided tour. That way, you’ll avoid waiting in line for over three hours on average. Arrival: 11:35a.m. - Departure: 12:30a.m. On the Basilica’s right side, you’ll find the gothic style Palace that once belonged to the Doge. 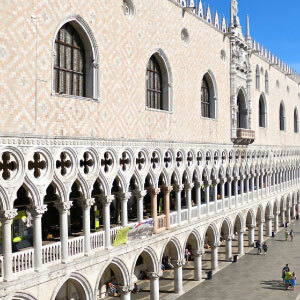 Doge’s Palace hides the most secret spots, myths and tales that surround Venice. In it’s underground levels, hidden from most tourists, are the cellars where the infamous Casanova was once imprisoned! Also, take note of the 9th and 10th columns on the side of the Palace. The light pink hue represents the standing point where the Doge used to read out death sentences. If you want to learn more secrets about the palace, check out our Doge’s Palace Secret Itineraries Tour. Apr-Oct every day 8:30am-7pm. Nov-Mar every day 8:30am-5:30pm. Arrival 12:40a.m. - Departure 1:35p.m. Just a 10-minute walk from St. Mark’s Square, the Libreria Acqua Alta (Library of High Water) is a true hidden gem in Venice. Buried inside this little book store are old traditional gondolas. In the past, the boats were used to prevent books from getting wet when the water levels in the lagoon rose. 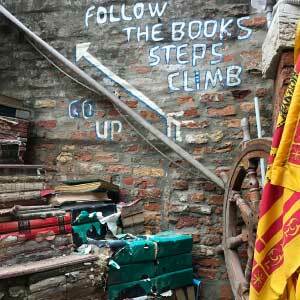 There’s even an escape staircase made out of books to climb in case the shop floods. This tiny place can get quite crowded on weekends, but week days are usually more quiet. Stop by here and pick up a book to read by the canals. Casual lunch at "Osteria al Portego"
Arrival: 1:30p.m. - Departure: 2:00p.m. After your early morning exploration, experience a real Venetian lunch break. 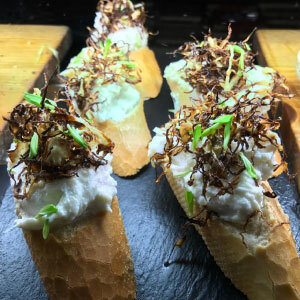 Osteria al Portego is a tasty local spot to get the best venetian cicchetti – what the locals call various types of finger foods . Enjoy cicchetti alongside an ombra, or glass of venetian wine. The word ombra (shadow), comes from a fisherman’s tradition of drinking a glass of wine in the shade of the bell tower on their lunch breaks. 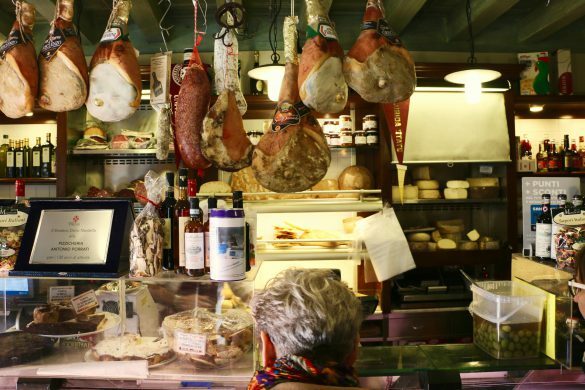 Venetian bars usually offer a variety of cicchetti, ranging from salami and prosciutto to seafood and baccalà, a traditional stock-fish recipe. All served on fresh, crunchy bread slices. Arrival 2:05p.m. - Departure 4:00p.m. The Rialto Bridge is another one of Venice’s top sightseeing attractions. The view from the top of the bridge is spectacular. 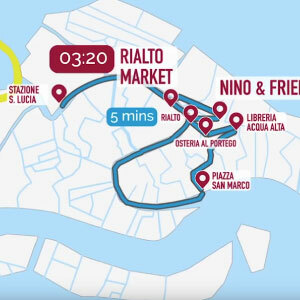 Even better though, is visiting the Rialto Fish Market. 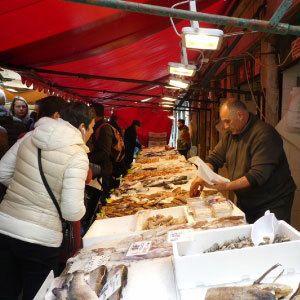 Venice was born as a fishing village and the market still provides an authentic glimpse of the island’s local culture. Take a walk through the stands and ask the local vendors to show you their best cuts. Sample the fresh produce and absorb the vibrant atmosphere of the fish market. Tue-Sat 7:30am-12pm. Fruit market Mon-Sat 7:30am-1:30pm. Arrival: 4:20p.m. - Departure: 5:00p.m. The Jewish Ghetto in Venice was instituted in 1516, making it the oldest in the world. Divided into the Ghetto Nuovo (“New Ghetto”), and the adjacent Ghetto Vecchio (“Old Ghetto”), the ghetto is located in the Cannaregio sestiere area of Venice. These days, the Jewish Ghetto is still important to the Jewish Community of Venice. 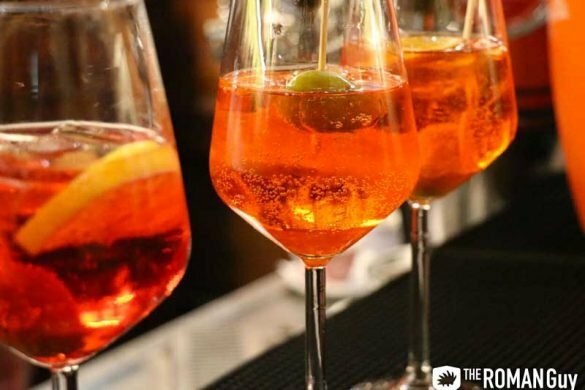 Make sure you get a chance to sit down and relax when you visit – there are several good bars or cicchetteria. Our favorite are Mezzopieno, Bacaro dai Morosi, and Birreria Zanon. There’s no better way to finish up seeing Venice in a day than with some tasty food and wine. Still want more? Luckily, you have several options to make your trip to Venice even better. If you want our local experts to create an Italy vacation itinerary for you based on your exact needs and wants, reach out to our Trip Planning Department! 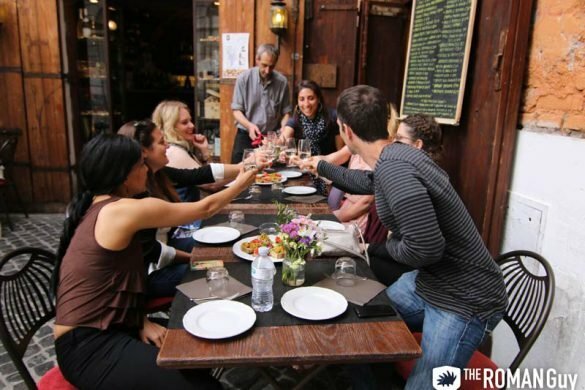 If you’re going to Venice and want us to take care of the entertainment, visit our Venice small group tours page! For more insights on must-see spots in Venice, read our article about 5 hidden gems in Venice you can’t miss! Hola! That’s a great list for a first-time visitor to Venice. 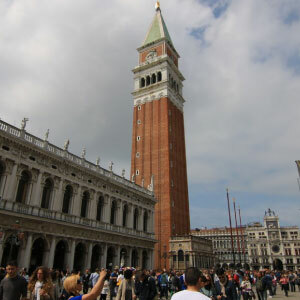 It would be also a great help if you could come up with a list of the best hotels to stay in Venice. Please suggest the names of the hotels which are close to the center. Thanks for your suggestion, we will make a note to put together a blog post with Hotel recommendations in Venice very soon!